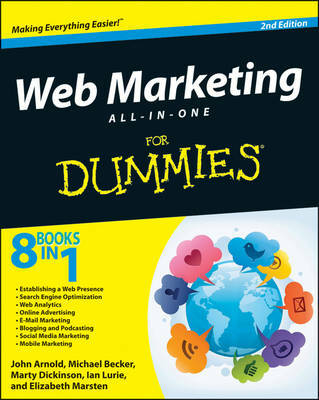 Build an online presence for your business with web marketing Why buy several books on web marketing when you can buy just one? With this must-have resource, five marketing professionals team up to share their expertise in the field of web marketing so that you can benefit from their know-how. Covering everything from site building, search engine optimization, and web analytics to online advertising, e-mail marketing, and harnessing the potential of social media, this team of web marketing gurus brings their insight and experience to the table and it's yours for the taking. * Provides invaluable advice for establishing a web presence and getting your message out with online advertising * Zeroes in on search engine optimization so that your site can be discovered by search engines and, ultimately, consumers * Explains how web analytics can offer you a better understanding of your web marketing efforts * Details ways to establish an online voice with blogging and podcasting * Walks you through the potential of social media marketing with Facebook, Twitter, and Google+ * Looks at various options for getting your message onto mobile platforms Web Marketing All in One For Dummies, 2nd Edition shows you how to get your online name out there so that customers can find you easily.